Two weeks home from a wonderful week in London and I have not written one word about it. NO WAY was it a failure! It was so fantastic that I am struggling to come back down to earth once more. The days, the people, the places and the fun & laughter and of course Toyboys… they still swirl around in my head. I had/have several crochet projects going on that had time limits, so my fingers were kept busy during the swirling, twirling kaleidoscopic aftermath of my adventures. There were also other reasons . I am playing my part in the preparations for a family gathering. For me that task is baking. Over the past few months I noticed that I was finding it more difficult to spend time reading or working at my computer. I was blaming my eyes, they would become tired quickly and the screen, the print or photographs seemed dull. An added difficulty was having a ‘Shiny’ screen that acted like a mirror in bright light ( no. I did not appreciate seeing my ould ragged face every time I opened my laptop). Poor Tobias Laptop has been limping for a long time, but on Thursday just as I found some time and inspiration to post on my blog, he gave up the ghost. Died. Dead as a door nail. I do have so much to share, the holiday and the craft work of the past months. I also have wonderful photos on a USB key, and only managed to add one for the moment. This entry was posted in Bloggers of the World trip, Blogging, Friends and tagged Bloggers of the world meet up, Blogging, Family, London 2016 on July 3, 2016 by Grannymar. We can wait… we’re just glad to have you back! As I often say to you Kate, one day at a time! My new laptop arrived yesterday and I am L e a r n i n g! I have to take it easy… I cannot find a delete button! As I said to Cathy below, Top right is the shut down button: Broken circle with a line through it. I did try it! Lovely to hear that you had such a good time, look forward to hearing some of the details! Once I have my photos sorted, the fun will begin…! “Toyboys… they still swirl around in my head.”…… read this as, “Toyboys… they still swirl around my head.” Had visions of young winged men…. perhaps as in “Barbarella”…. 😆 The Toyboys were just the right age for me. All Gentlemen! How lovely to wake up to an email from Grannymar. Happy to hear you had a good trip and I’m looking forward to the details. Interestingly, my first thought when looking at the picture of you and Barbara was that the Molony genes are very present. I was instantly reminded of my Father-In-Law Terrence Molony. Maureen, now I’m worried! Post a photo of Terence please? Barbara, Terrence Molony was from Kildysart and related to John Molony your great granfather, but not a brother. 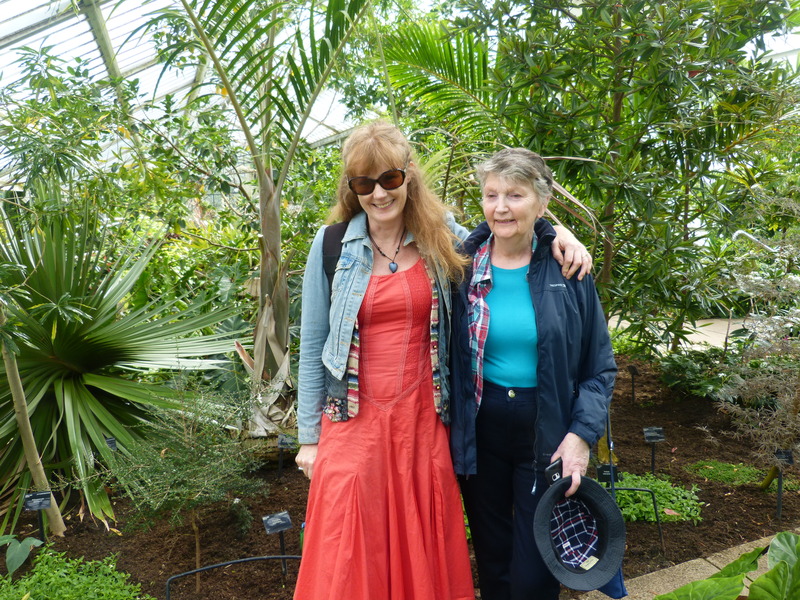 Maureen, Barbara is my eldest niece, and towering over me these day. We have quite a few long legged people in the the younger generations. YeeHaw! You go girl! We will wait til you are ready to reveal your activities! Brig, it was great fun. Even thinking about it made me smile. Glad you had fun in London! Take your time. I can understand why you are unable to write. With my new laptop I have no more excuses, except…. A gathering, a party and a gift to complete! July does not look any lighter than June. I look forward to seeing you and your gang soon! Great you’ve back, and by the sounds of it, we are in for some surprises! My last laptop had the on/off button above the keyboard, this one it is part of the keys and last key on the right of the top row which comprises of short cut keys… I am still learning what they all do! Look forward to hearing all the details of your London trip. Do you mean your eyes weren’t actually the problem, it was the dying laptop? Is everything okay now with the new one? I know what you men about the eyes – LOL – luckily my kindle lets me change the font size rather easily. But I am still knocking back almost a book a day -(short 250 -300 page or so mysteries). I do find time for the odd Aussie mystery TV show though – LOL – thanks to HULU. I envy your trip to London -m glad you had such a good time!! With the old laptop I had increased the font size several points. So far with this one I have not changed anything, the case is white and seems to set the keys out more clearly. I will get round to it in the next few days. I do have all my photos, I just need to get them from where they are, to where I want them to be. Third world problem. What brand do you have, Marie? Maybe I can help. And sometimes the handbooks are filmed and on youtube. Thank you Lin, I will be seeing Elly tomorrow and she will sort me out. I have my list of questions at the ready. Anything I know about the world of technology, I learned from her. She is a good teacher. We’re thinking of spending a bit of time in England sometime within the next year or so, so I’ll be looking forward to all the details. Tom, I only covered a very small area of London, yet my days were busy. People were my priority. The picture is a great foretaste of what you will be offering! Col, I still have a few glitches that need sorting… nearly there. I have discovered how to delete! As long as you don’t use that new skill on ones that didn’t ought to be deleticated! Col, I am being ultra careful at the moment and learning the new way to download my photos. I spent 2 weeks in London in November 1969 and I had a great time. Not quite there yet… family stuff has intervened. We all know that family must come first. Every time.